Dr. Ball completed medical school, residency, and his Critical Care fellowship at Western University before pursuing his fellowship in Clinical Pharmacology and Toxicology at the University of Toronto. Dr. Ball did his MSc Epidemiology at the University of Ottawa. His thesis was the derivation and validation of clinical prediction rules for mortality in critically ill elderly Canadians. 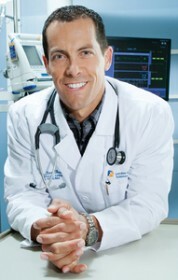 In 2008, Dr. Ball joined the faculty at Queen’s University. He chaired the Organ Donation and Transplantation Committee at Kingston General Hospital and was a pioneer with Donation After Cardiac Death there. In July 2014, Dr. Ball returned to Western University to develop his research programs in rehabilitation in the critically ill, organ donation, and end of life care. He is a Regional Medical Lead for Organ Donation with Trillium Gift of Life Foundation, and chairs the London Health Sciences Center Organ Donor Management Committee.